Wow… now that’s asking for it. Wonder if that was alcohol he was drinking? A fire-breather was performing at the Tattoo Arts Convention in Philadelphia when things got a little too real. He set himself on fire and the building. The unnamed performer ran off stage and put himself out. An event organizer used his noggin and overturned a table to squelch most of the fire. The performer ran back up, shirtless, and stamped the rest of it out before exiting stage left. That’s show business, I guess. 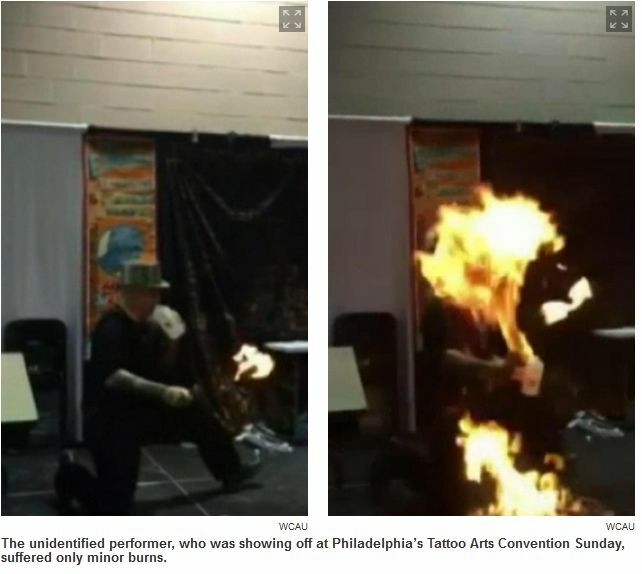 The unidentified performer, who was showing off at Philadelphia’s Tattoo Arts Convention Sunday, looked like he was in serious trouble but wound up suffering only minor burns. This feat really was death-defying. A man performing a fire-breathing stunt accidentally set himself ablaze during a festival in Philadelphia on Sunday, and he walked away unharmed. The unidentified fire-breather was performing at Philadelphia’s Tattoo Arts Convention. He blew flames out of his mouth, waved a fiery baton — and suddenly found himself engulfed in fire, which quickly spread to the stage. The blazing performer walked off stage and snuffed out the fire that was burning his clothing. Event organizers quickly doused the burning stage. A spectator caught the mishap on camera, NBC Philadelphia reported. The performer suffered minor burns and did not require hospitalization. No one else was injured, organizers said. For a moment there, I had a flashback to The Station nightclub fire in 2003, where the band Great White accidentally set the club on fire with a pyrotechnics display. Over 100 people died and Daniel Michel Biechele, the band’s tour manager, went to prison for 10 years. I’m glad no one got hurt at this event, but it could have become a very deadly incident, very quickly. It could have been death defying for everyone at that convention. There’s a reason you don’t ‘play’ with fire.